By 1880, Bismarck’s population was nearing 2,000 and it had established a strong foundation to support a prosperous city. BNSF/Northern Pacific Railroad Bridge, completed in 1882. After surviving bankruptcy, Northern Pacific emerged with enough capital to complete its northern transcontinental railroad. 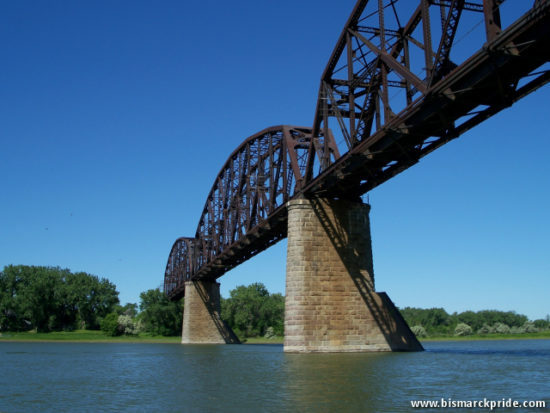 The multi-million dollar bridge spanning the Missouri River finally opened in October 1882, nearly ten years after the railroad reached Bismarck. While the ceremonial golden spike took place the month prior, in western Montana, the bridge officially completed the line. The following year, 1883, marked two significant progressions: Establishing the territorial penitentiary in Bismarck and, more importantly, moving the capital of Dakota Territory from Yankton to Bismarck. Despite its seemingly obvious choice as capital, however, Bismarck was not initially favored among the dozen or so prospects, and Yankton would not willingly cede the capital without a fight. In March 1883, the territorial legislature narrowly passed the capital commission bill that demoted Yankton as capital of Dakota Territory and established requirements for selecting a new capital. Governor Ordway signed the bill, known as house file number 217, on March 8, 1883. Alexander McKenzie during the 1880s. Picture Courtesy North Dakota State Historic Society. The bill defined the nine-man commission tasked with selecting the capital, setting a July 1, 1883 deadline. It proclaimed that the commissioners be paid $6 per day for their work and that each enter into bonds totaling $40,000. One of these commissioners was Alexander McKenzie, a Northern Pacific agent from Bismarck who later becomes a powerful political boss. Another, the committee chairman, was General Alexander Hughes of Elk Point, who later establishes Hughes Electric with his son in Bismarck. The commission bill required that the chosen city donate or guarantee $100,000 and 160 acres of land in which to construct a capitol for the seat of government. Another requirement was that the site be central and accessible from all portions of the territory. Commissioners considered both the current and future boundaries, given that there was contemplation that the territory would be split at the 46th parallel (ultimately, it was the 49th parallel). At least nine cities were under legitimate consideration to be the new capital. Huron, Mitchell, Pierre, Ordway, Frankfort, and Steele were the first to submit bids, followed by Bismarck, Aberdeen, Redfield, and a handful of others. Statistically, Bismarck was a logical choice. Its location was roughly 40 miles from the territory’s geographic center and would have remained within 50 miles after the foreseeable boundary split. It was also positioned at the crossroad of the northern transcontinental railroad and Missouri River, the highways of the era. Furthermore, the Northern Pacific Railway – and all its clout – favored Bismarck. In reality, Bismarck was perceived to be on the border of civilization and some viewed the area west of the Missouri River as barren waste. At least one committeeman, Chairman Hughes, however, later admitted in an interview with the St. Paul Dispatch that his perception conversed after traveling the region during the vetting process. With the bulk of the population centered in the southern half of Dakota Territory, it was anticipated that the capital would remain there. In particular, Huron and Redfield were thought to be early front-runners. As an underdog, Bismarck presented a competitive bid that far exceeded the minimum requirements: 320 acres, along with the monetary stipulation. 160 of those acres would be sold and guaranteed by private citizens for $300,000, bringing Bismarck’s total offer to $400,000 and 160 acres of land. Northern Pacific would donate the land while private citizens would contribute the remaining funds. The commissioners visited each city under consideration before convening in Fargo in May to make the final determination. There, in a last-ditch effort, a group of Fargo citizens demanded a hearing in front of the commission to request a delay, in an attempt to persuade Fargo as a contender. Fargo never was a serious contender, though. The bill’s stipulations required that the capital be centrally located within the territory. After a short hearing, the request was denied and the first ballots were cast on June 1. 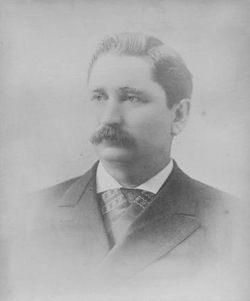 Only one commissioner initially voted for Bismarck… Alexander McKenzie, Burleigh Country Sheriff and an agent for Northern Pacific. Interestingly, McKenzie himself voted against Bismarck in the second ballot round, opting instead for nearby Steele. After 13 votes over two days, Bismarck won the majority on June 2. McKenzie is credited with negotiating to procure enough votes. In the end, Hughes cast the tie-breaking vote after previously supporting Mitchell and Redfield. Original Capitol’s cornerstone ceremony. Numerous dignitaries attended, including Sitting Bull and former President Ulysses S. Grant. Upon approval by the governor, Yankton was immediately stripped of its position. 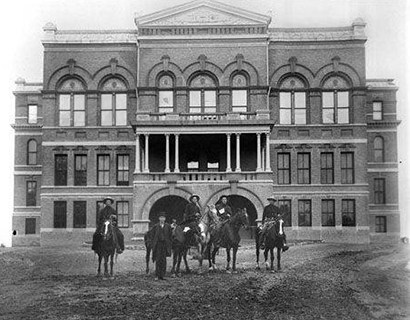 Territorial offices were setup in a temporary capitol in Bismarck until a permanent structure could be completed. 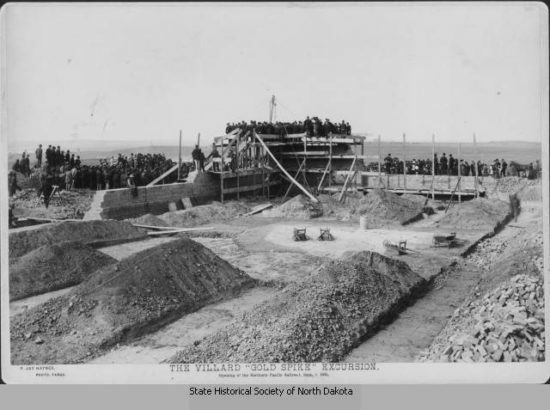 The cornerstone for a new capitol building was laid on September 5, where numerous dignitaries attended, including Sitting Bull and former President Ulysses S. Grant. First occupancy of the new capitol occurred at the end of 1884, just in time for the 1885 legislative assembly. Yankton would not give up its capital so easily, challenging the constitutionality of its relocation. Allegedly, only the legislature and governor could assign a capital, not a commission. District Chief Justice Edgerton, a Yankton local, agreed. He granted a restraining order against the commissioners, declared that its officers were appointed illegally, and removed them from office. The legal matter was appealed to the territorial Supreme Court, who overruled Judge Edgerton’s decision, but not until September 1884, when construction was already nearly complete on the new capitol. Nevertheless, Bismarck was legally victorious in procuring the capital. 1873-1879: Railroad Arrives, New Name, Panic!